When you are searching for your next heavy-duty and work-ready pickup truck that has the power and torque to tackle any job, turn to Ram trucks and the 2018 Ram 2500. With its range of available HEMI V8 and Cummins turbo-diesel engines plus 6-passenger seating, the new Ram 2500 is the ideal work truck for just about any job you can encounter. Drivers near Baton Rouge and Central, LA can discover the 2018 Ram 2500 truck at All Star Dodge Chrysler Jeep Ram. 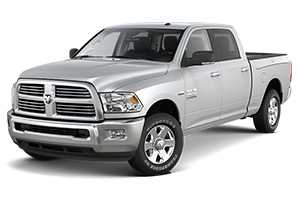 Our entire inventory of new Ram 2500 pickup trucks can be explored online or in-person at our Chrysler, Dodge, Jeep, Ram and Fiat dealership. The latest iteration of Ram 2500 3/4-ton pickup trucks are built for heavy-duty work; that is why these trucks come equipped with a turbo-diesel or HEMI V8 engine, plus a heavy-duty transmission. Even the 2018 Ram 2500 base model gets a potent 5.7-liter HEMI V8 engine with variable valve timing (VVT) under its hood, pumping out 383 hp and 400 lb-ft of torque. 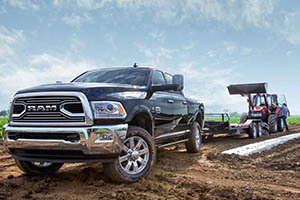 The Ram 2500's 5.7-liter HEMI V8 engine proves its might with its impressive maximum towing capacity of 13,890 pounds. Ram's 6.4-liter HEMI V8 is also available in this 3/4-ton pickup and develops 410 hp and 429 lb-ft of torque, while returning a best-in-class maximum towing capacity of 16,320 pounds! For incredible torque, towing capability and fuel economy in a heavy-duty work truck, the 2018 Ram 2500 equipped with a 6.7-liter Cummins Turbo Diesel I6 engine is the way to go. The turbo-diesel Ram 2500 sends 800 lb-ft of torque to the rear wheels or all four, when equipped with 4WD, and impresses with its maximum towing capacity of 17,980 pounds. If you ever spend long days behind the wheel of your pickup truck or moving from job site to job site, then the roomy and well-equipped cabin of the 2018 Ram 2500 will be much appreciated. With its Uconnect infotainment system, large touchscreen display, backup camera and available leather seating for six passengers plus heated front seats, the new Ram 2500 can be your roomy and well-equipped mobile office. Central and Baton Rouge, LA area pickup truck buyers can visit All Star Dodge Chrysler Jeep Ram for a test drive of the Ram 2500 heavy-duty pickup truck. As a full-service dealership specializing in Chrysler, Dodge, Jeep and Ram vehicles, we have a auto service center on-site that will perform routine maintenance on your Ram or another vehicle to keep your daily routine on track. Visit or contact us in Denham Springs, LA today, and apply for auto financing online before your test drive of the 2018 Ram 2500.